This excerpt, taken from Deer Trails, a poem by Badger Clark, fittingly describes the drama produced by South Dakota Public Television, MOUNTAIN THUNDER, A BALLAD OF BADGER CLARK. 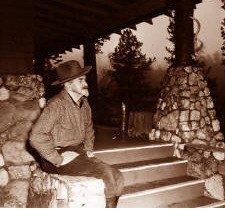 This dramatic portrayal of Badger Clark, South Dakota's first poet laureate (also known as the –cowboy poet”) was taped over the fall and winter of 1996-1997 in Clark's cabin, affectionately referred to as –the Badger Hole,” in Custer State Park, where he lived much of his life. The drama is based on the play of the same title written by former Mitchell resident, Kenn Pierson. Darryl F. Patten, former Director of Drama at Dakota Weslyan University, Mitchell, stars in the drama. Patten's energetic portrayals of Badger Clark introduce new generations to the writings of Badger Clark, while his striking resemblance to Clark fascinate those who still remember the cowboy poet. Patten, who died as SDPB completed taping, had portrayed Badger Clark in hundreds of performances since 1986 in South Dakota, Montana and Japan. MOUNTAIN THUNDER, A BALLAD OF BADGER CLARK portrays the personality, philosophy and essence of the cowboy poet through a monologue in which the poet reacts to letters from a friend. Set in the beautiful surroundings of Custer State Park, this drama is sure to become a SDPTV classic. Born January 1, 1883 in Albia, Iowa, Badger Clark, at the age of three months, was brought by his family to the Dakota Territory, where his father, a Methodist Minister, developed a homestead near Plankinton to recover from Civil War injuries. The family moved to Deadwood after Badger's mother contracted tuberculosis, thinking that the mountain air would help her. Badger graduated from Deadwood High School and attended Dakota Wesleyan University for one year. Realizing that university life was too confining for the young man who preferred the outdoors, Clark spent two years working on a hog and pineapple plantation in Cuba. After contracting malaria, Clark returned to the Badlands to restore his health. Unfortunately, that winter after recovering from malaria, Clark was diagnosed with tuberculosis and was advised to move to a dry climate. Clark took this advice and moved to Arizona where he managed a small herd of cattle and cooked for some of the cowboys on a ranch near the Mexican border. Clark enjoyed cowboy life so much that he began writing poetry about it. Badger Clark was named poet laureate of South Dakota in 1937, and as a result was asked to write poetry on many occasions of state and national events. His poems have become part of the folklore of the West. Aside from poetry, Badger has also authored histories of Custer State Park, Hot Springs (When Hot Springs Was a Pup), Custer City, and many articles in books containing collections of stories. A number of his poems have been set to music. Among them, Lead My America, set to music in 1957 by Dr. Harold Dudley of Washington D.C. and performed by the Fred Waring Chorus and military choruses in the nation's capital. Badger Clark was inducted into the South Dakota Heritage Hall of Fame in 1980, at which time a slide show depicting his life and containing interviews of persons who knew Badger was produced by Milton and Shebby Lee. The slide show is shown regularly at visitor programs in Custer State Park. In 1984, a non-profit organization, The Badger Clark Memorial Society, was instituted to provide maintenance at the Badger Hole, to serve as volunteer hosts and hostesses there during the summer, and to republish Clark's books. 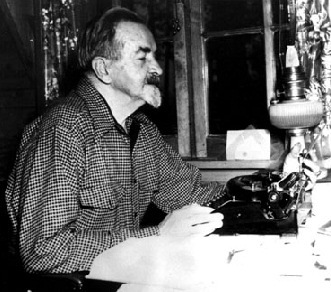 Kenn Pierson, author of the play Mountain Thunder, A Ballad of Badger Clark, was born and raised in the area of Mitchell, South Dakota. He graduated in 1979 from Dakota Wesleyan University, where he received the Badger Clark Memorial Award in Creative Writing. In 1981, Pierson received a Master of Arts degree in English from the State University of New York at Buffalo. Doctoral work in American literature followed at the University of Minnesota where he served as Associate Playwright at the Playwright's Center, Playwright-in-Residence at the Cricket Theatre, and Dramaturgical Intern at the Guthrie Theatre. Since 1988 he has lived in Michigan, serving as playwright/composer-in-residence at Serpent's Tooth Theatre (which he co-founded) and teaching at the University of Michigan and Wayne State University. Pierson's other plays include Left Living, In Keiko's House, an adaptation of Walt Whitman's Leaves of Grass, Josie!, The Sprit of St. Louis, Never Too Young, Richard's Mother and Andreyev and Andy. A recording of Pierson's theatre songs is forthcoming. Darryl F. Patten, former Director of Drama at Dakota Wesleyan University in Mitchell, has portrayed South Dakota's first poet laureate, Badger Clark, in hundreds of stage performances since 1985... performances which took him from the plains of South Dakota to the islands of Japan. His physical resemblance to Clark, his mannerisms, his sensitivity to and his knowledge of the very character of Badger Clark, right down to the twinkle in his eye make his portrayal uncanny and hauntingly real. Patten, who died as SDPB completed taping in 1997, has introduced new generations to the writings of Badger Clark through his energetic portrayals, while his striking resemblance to Clark fascinate those who still remember the cowboy poet.